We’ve all heard of ‘Bucket Lists’ – so what is a Mug List? Last week a friend and I enjoyed the luxury of catching up without kids for a coffee. It was an odd feeling leaving the house without my boys, and not having to think about the logistics of where the pram would fit, availability of a highchair and kids menus was refreshing. It’s also amazing the amount and depth of conversation you can cover when you aren’t interrupting each other with comments such as ‘don’t eat the butter, please sit down and don’t pinch your brother’. Over coffee (of course) we got to talking about an all too familiar topic for me… That time on a Sunday afternoon when you look back over your weekend, the precious couple of days you have with your whole family, and realise you haven’t really done anything. I’m guilty of this, and I’m sure there are plenty of others out there who are in the same boat – well I’m going to tell myself that anyway! I’m guilty of telling myself, and my husband, that I am going to do this, we must go there – but all too often everyday life gets in the way and it’s easy to find an ‘excuse’ not to go somewhere or do something. We both vowed that this was going to be our year to not just talk about what we were going to do – but to actually do it. This gave us the idea of making a list each month of things we wanted to accomplish – whether it be something we wanted to do with our kids, or a personal goal. We agreed the name ‘bucket list’ wasn’t really appropriate, and as we were having a coffee (and I was drinking from the biggest mug available), we decided to name our idea The Mug list. At the beginning of each month, we will write a list of things we want to do or achieve. It can be anything – activities with the kids, personal goals – the possibilities are endless. The idea is to display the list somewhere you can see it (and most importantly remember what’s on it!) and you can then make off your items as the month progresses. For me, 2014 is a year of keeping it simple…. enjoying the simple, everyday moments of life, and trying not overcomplicating things. That’s why I decided to kick off my list with what I hope will be easy, achievable goals. I decided to share my list in an attempt to make me accountable for following through, and I’ll share my shortcomings success at the end of each month. 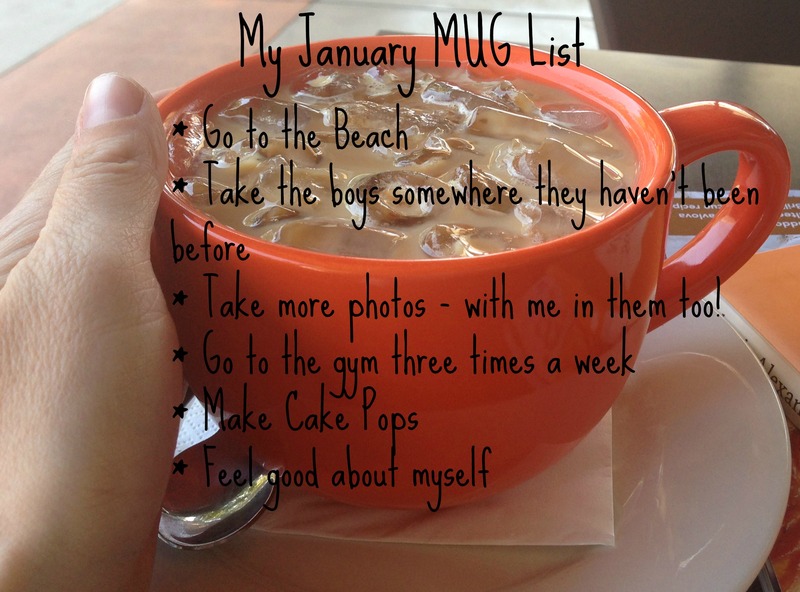 Feel free to join me, what will you put on your Mug List for January?